Whilst the region is known as a paradise for cyclists, a flat tyre or bent spoke can never be ruled out. 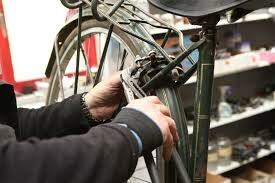 The cycle breakdown service of the Fietsenatelier is unique in Flanders. Two mobile bicycle repair vehicles manned by trained technicians are always available. Minor breakdowns repaired on the spot. For larger problems, a courtesy bicycle will be provided. Free service when renting bicycles at Fietsenatelier of the Zilvermeer. Service also available for your private bicycle, on payment of a fee.